Our research has found more and more people are visiting quirky-Cumbria for a camping holiday with an unusual twist, by choosing accommodation that breaks from the ‘norm’ of more traditional holiday accommodation like hotels, caravans and tents. In 2018, Cumbria has more unusual places to stay than ever before. 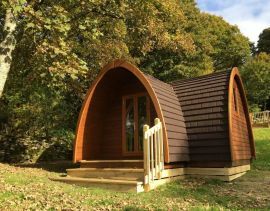 As the popularity of glamping continues to grow, there’s been a surge of interest by holidaymakers who want to swap their hotel for a yurt, or their tent for a glamping pod. According to our research team, over the last 12 months there has been a 25% rise in alternative camping provision across the county – with facilities on existing sites being developed to adapt to changing trends, as well as new sites being opened. Whether it’s sleeping under the stars and waking up to views of Skiddaw from a shepherd’s hut at Lanefoot Farm at Keswick or living like a hobbit in an underground hideaway at ‘The Quiet Site’ at Ullswater, there’s no doubt that the experience on offer in Cumbria is more varied than ever before. Keswick’s Inside Out Camping offers campers the luxury of a 16ft yurt in the Borrowdale Valley, or why not snuggle down in a heated and sheep-wool insulated pod at Windermere’s Park Cliffe Camping Pods? If that’s not enough, try Wallace Lane Farm at Caldbeck; where its 21 square-metre glamping cabins offer spectacular views over the Solway and Scottish mountains. This year’s heatwave – 42 years in the making – has resulted in increased interest in the county’s camp & ‘glamp’ sites by those who fancied giving shepherd’s huts, camping barns and bunkhouses a try. For those who are curious – but not quite ready to leave their traditional tent or caravan behind – our research shows there’s still plenty of space for them too, with 176 sites across the county offering camping or touring caravan spaces. That works out at just under 10,000 pitches altogether. Touring caravan and camping pitch occupancy in 2017 was the highest in Cumbria on record, up around 8% on 2016. Researchers also say 2018 may exceed that figure. For those visitors ready to try something different and who are looking for somewhere unique to stay in Cumbria – with no tent-erecting experience required, check out www.golakes.co.uk for some inspiration.